Antiferromagnets (AF) are currently in the limelight thanks to recent breakthroughs demonstrating the efficient effect of spin currents in interacting with the AF order parameter [1,2]. So far, due to the lack of net magnetization, controlling AF distributions has been rather challenging. Current-induced	AF control also opens new perspectives in Terahertz magnetization dynamics. On the materials side, antiferromagnets represent the large majority of magnetic materials. Some of them show several simultaneous ordered phases and are commonly called ‘multiferroics’. As a result, when the AF order is coupled to a net polarization, it may be controlled by applying a voltage. Generally speaking, multiferroic materials  are the focus of an intense research effort due to the significant technological interest of multifunctional materials as well as the rich fundamental physics lying in the coupling of various order parameters. 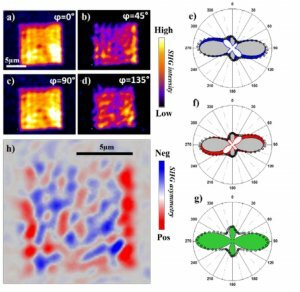 Among all multiferroics, BiFeO3 (BFO) is a material of choice because its two ordering temperatures (ferroelectric FE and AF) are well above room temperature. Figure 1 : SHG study of antiferromagnetic domains in BiFeO3 thin epitaxial layer. (a-d) SHG intensity images for different incident light polarization direction, ϕ. (e-g) 3 kind of Polarization angular dependence of the SHG intensity observed in the ferroelectric monodomain. ( h) Reconstructed AF domains image. In addition a large magnetoelectric coupling has been demonstrated in single crystals as well as in thin films. Second harmonic generation has proven to be a powerful and elegant way to assess complex multiferroïc textures and to unentangle the different contributions at play . In this presentation, we will present a study demonstrating the possibility to use second harmonic generation (SHG) to access the micron sized distribution of AF domain (Figure 1) in a multiferroic thin film. We will also show that they can also be efficiently manipulated by the internally optically rectified sub-picosecond electric fields. This opens the door to an all-optical terahertz control the AF order, independently of the electric polarization, but still using the magnetoelectric effect.